Developments in driveline technology have led implement manufacturers to consider alternatives to traditional pto systems. 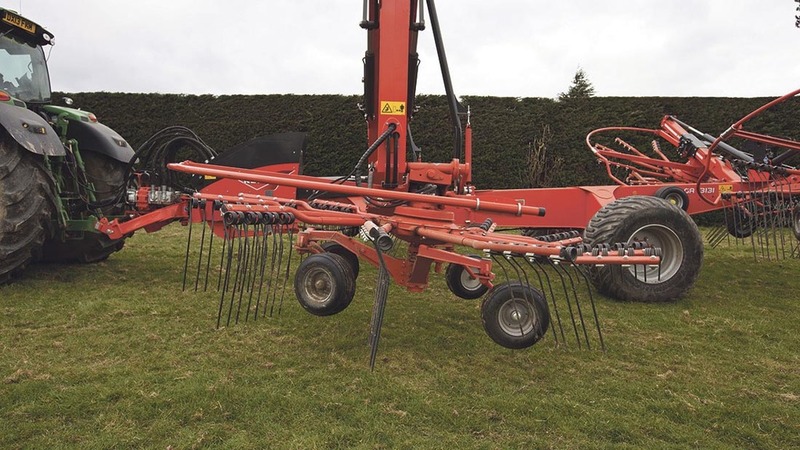 Geoff Ashcroft takes a close look at Kuhn’s hydraulically driven four rotor rake. While the fundamental design of rakes has not changed much over the years, improvements in electronic control and increased hydraulic efficiency have led to manufacturers moving away from traditional shaft drives. 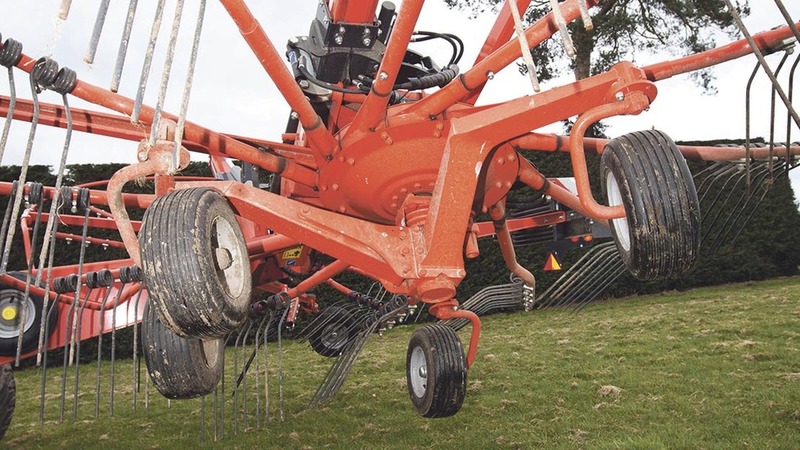 Not having a rigid drive lines brings benefits when folding, and the flexibility to control several aspects of the rake, including independent control of rotor heads, means large rakes need not be lumbering machines that are tricky to handle around in-field obstacles. 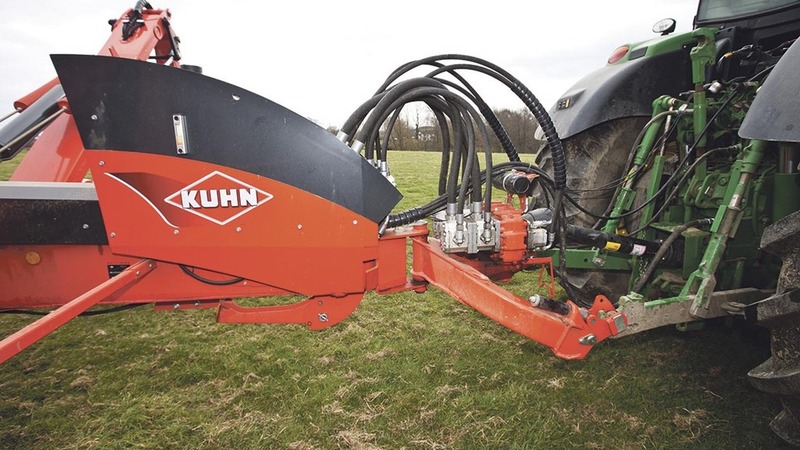 One of the more innovative models to come to market in recent years is Kuhn’s GA13131, and this example, in use with Morton, Oswestry-based contractor John Roberts and Son, makes the most of hydraulic capability without placing high demands on the tractor. An integral oil system, powered by the pto, takes care of rotor drives and adjustments, reducing reliance on tractor spools. It only needs one spool to take care of folding, and this 5,150kg rake can be operated with as little as 95hp, says the manufacturer. 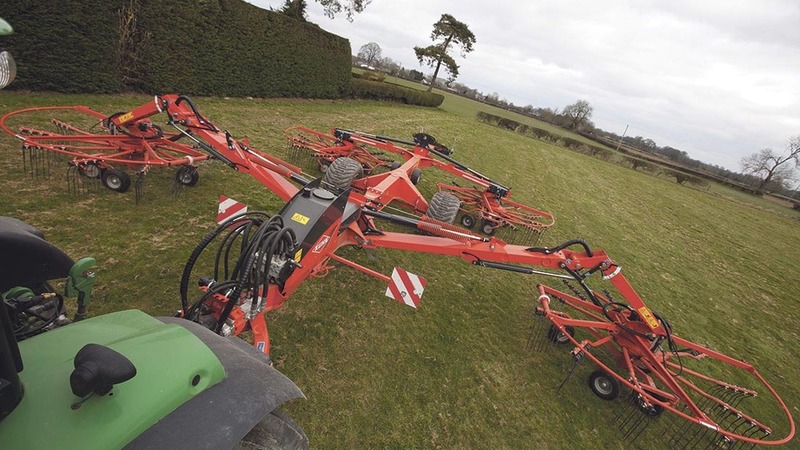 Introduced for the 2014 season, retailing at £59,480, the 13m GA13131 is not the French maker’s first foray into the four-rotor market – Kuhn showed a 15m model in 2002, but none were ever sold into the UK. In addition to hydraulic adjustment of working width from 8.4-12.5m, and a hydrostatic driveline for its rotors, the GA13131 offers a level of adjustability through its VT50 IsoBus terminal that would appear to deliver an impressive range of controllability. With the ability to program a headland sequence based on either time or distance, or use manual over-ride to lift rotors individually, this row making giant is no longer the preserve of large, open fields. 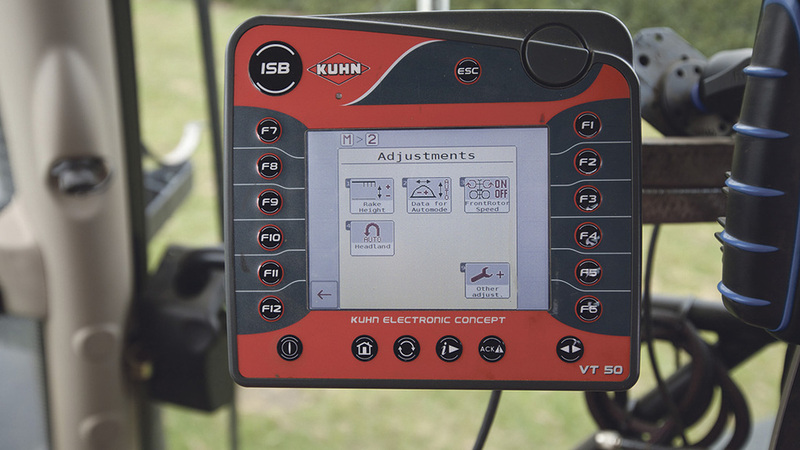 To make the most of this rake’s vast array of adjustment, we sought a few tips from Kuhn’s technical support engineer, Steve Carver. 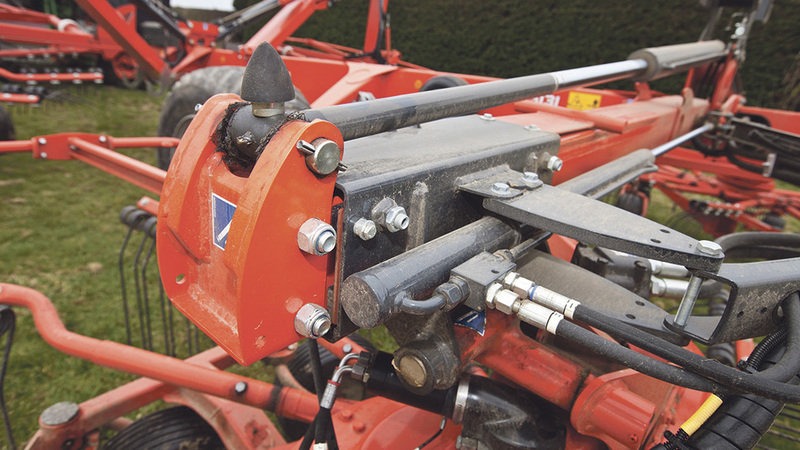 Hinged arms, instead of telescopic boom sections for the front rotors help to deliver a transport height of 3.95m without having to remove tine arms. All four rotors on the GA13131 are 3.2m in diameter. 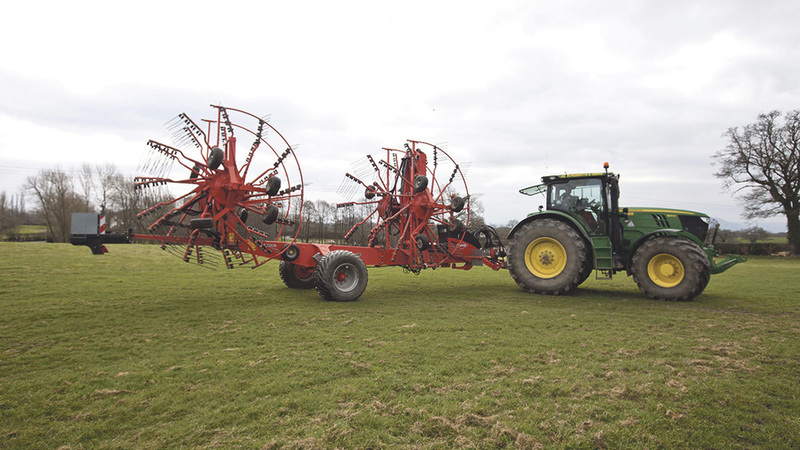 But where the front rotors carry 11 tine arms, the rear rotors are equipped with 12, to accommodate a higher volume of grass passing through the rear section of the machine. A rotor boost function is available through the control box, increasing the speed of the front rotors by up to 20 per cent to overcome roping. Faster front rotor speed also delivers crop closer to the centre of the chassis, says the firm, easing the work for the rear rotors. Forward speed is dependent on crop volume; too fast and the tines will not have enough time to work effectively and are likely to leave crop behind, too slow and you will soon have a forager breathing down your neck. Setting the working width of the GA13131 is achieved with the help of angle sensors. This makes it easier to replicate the position of rotors on both sides of the rake. 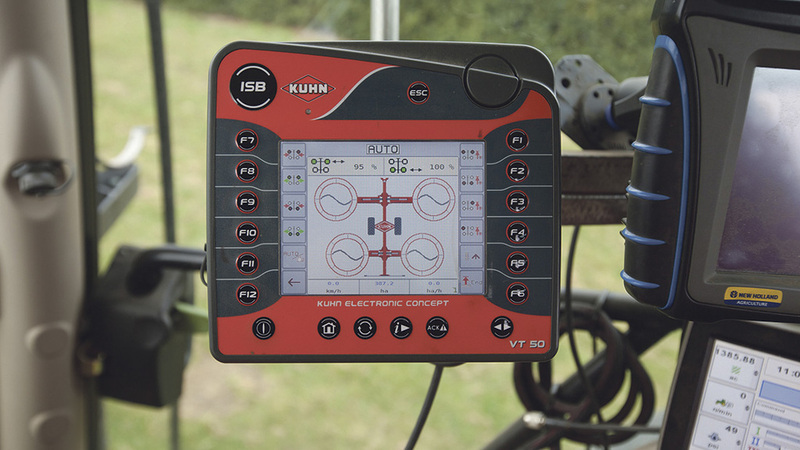 Adjustment is managed through the VT50 in-cab terminal, and shown on-screen as a percentage, though mechanical pointers on both boom sections give a clear visual reference of where the rake’s working width is set. These angle sensors also control the lift height when making headland turns. Telescopic rear rotors use adjustable nylon pads that slide against the box section frame. Excess play can be adjusted out, to prevent the rotor arms from moving too much. Rear rotor working width can be tweaked from the cab to adjust the width of swath delivered from 1.4-2.4m. An on-board hydraulic system carries 175-litres of oil, which needs changing every 1,200 hours or four years – whichever comes first. There are four hydraulic pumps; one per rotor, where a hydraulic motor turns a spur gear inside the rotor gearbox. Hydraulic pumps are mounted in tandem on the back of the main gearbox, which is carried on the machine’s swivelling headstock. 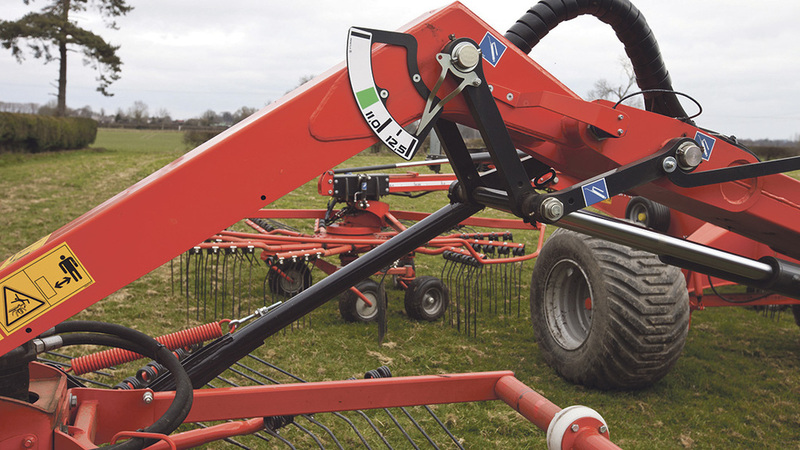 Being link-arm mounted should ensure a straight, trouble-free driveline, and pto input speed can be via economy pto, to make the most of any fuel saving capability. Kuhn uses a four-wheel undercarriage for each of the GA13131’s rotors, with each wheel allowed to pivot, to prevent scuffing when turning. The length of the undercarriage affords contour following ability, making the most of changes in terrain without affecting rake performance. Two spare wheels are carried on the chassis. Stabilising rams and springs on the front of each rotor serve two purposes on the GA13131. They prevent excess oscillation of rotor heads when the rake has been lifted out of work; and they also hold the front of each rotor higher than the rear, when out of work. Like an aircraft coming into land, this has the effect of putting the rear wheels of the undercarriage down first, which eases tines back into work without the risk of touching soil. Raking performance is influenced by working height, says Mr Carver. With tines too high, you will leave crop behind, and if they are too low, you run the risk of contaminating forage with soil and stones. Indicators on undercarriage of both front rotors offer an easy visual reference to working height, and button pushing via the control box lets you hydraulically tweak rotor heights on the move. 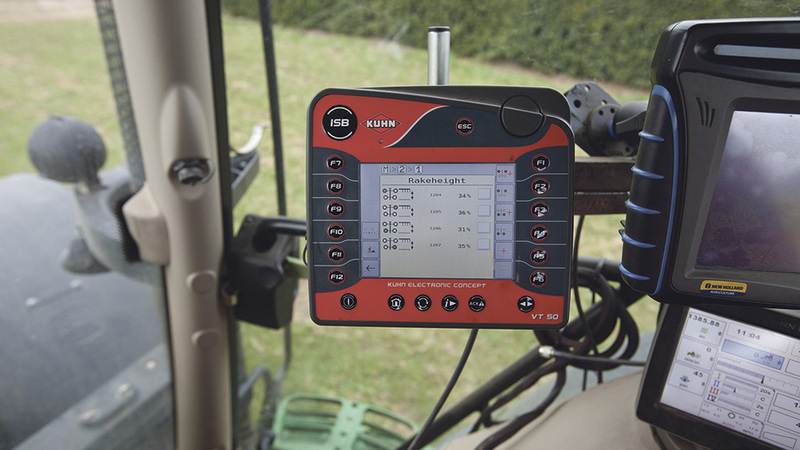 VT50 terminal carries 12 function keys and touchscreen capability, offering access to the machine’s functions. Automatic headland sequences can be selected, using time or distance to determine rotor lift and lower points. Front rotors can be individually raised and lowered too, to account for tapering field shapes. As part of the standard specification, the rake is supplied with a power harness for use with non-Iso tractors – make sure this lead comes with the rake, as it costs £504 to replace. In addition to endless levels of adjustment, the control terminal offers a trip computer function showing hours worked, area covered and distance travelled. Information is stored on the chassis, within the rake’s main controller, and not on the in-cab terminal. A USB connection allows software upgrades to be carried out through the VT50 terminal.